The executive director of the United States Interagency Council on Homelessness, which coordinates the federal response on the issue, said in a letter to Mayor Bill de Blasio this week that [New York] city had “effectively” ended chronic homelessness among veterans. In 2015 alone, the city placed more than 1,000 veterans in permanent housing, according to city officials. Several weeks ago, at Clinton Avenue Residence, a new 43-unit development in the Bronx specifically for veterans, several men dragged garbage bags with their belongings through the gleaming lobby and into their studio apartments. “I woke up and there wasn’t a person sleeping three feet away,” Eric Peters, 54, an Air Force veteran who has been in and out of homelessness for decades, said the next morning. Houston, Las Vegas and New Orleans, among several cities, [have] effectively ending overall veteran homelessness, meaning they have identified all homeless veterans, not just the chronic cases, and placed them in homes. The city’s efforts are part of a broader federal initiative, started under President Obama and aimed at ending veteran homelessness in the United States. The federal housing agency, working in partnership with the Department of Veterans Affairs, has now distributed 79,000 rental assistance vouchers to veterans across the country dating to 2008. Three cheers for both the hard work being done at both the national and local levels. I hope the program serves as a model to tackle homelessness writ large — but I have no problem with selecting veterans as the first to demonstrate that the world’s last superpower does not in fact have to house its people in cardboard boxes. But I do want to point out what’s obvious in this crowd, and should be so in the wide world: this is what respect — and more, support — for those who serve our military looks like. The next time your wingnut acquaintance spouts about the Muslim Kenyan Usurpers disregard for the armed services, point this out to her or him — and ask him which GOPster has made this a priority. 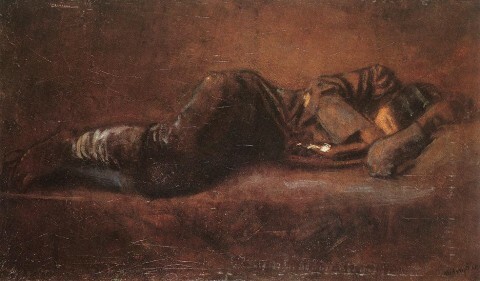 Image: Ladislav Medňanský, Reclining Soldier, c. 1916. This entry was posted on January 1, 2016 at 7:12 pm and is filed under Military, Obama, The Way We Live Now, War. You can subscribe via RSS 2.0 feed to this post's comments.